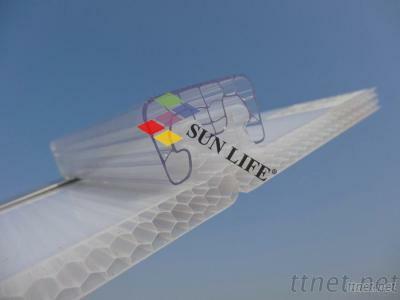 Sun Life® multiwall polycarbonate sheet system combines new design, light transmission, good heat-proof insulation and high impact-resistance strength. It offers a lightweight, leak-proof design that withstands very high loads and accommodates expansion and contraction. The system’s distinct advantages make it ideal for long-term application on many projects needed good quality. As with any true architectural glazing system, it is appropriate for a variety of roofing and cladding designs, flat or curved. it is a self fastening system, based on multiwall sheet, and is available in a range of thicknesses. Modular glazing system with special panels in honeycomb structure and connector profile in polycarbonate. The system is completed with fixing and closing accessories. Due to the pleasant appearance of the surface and the absence of fixing holes on the polycarbonate there is the best guarantee against water infiltration.